This adorably designed kids ornament personalized as a lasting keepsake features a pair of festively dressed youngsters smiling brightly in their Santa caps and mittens. 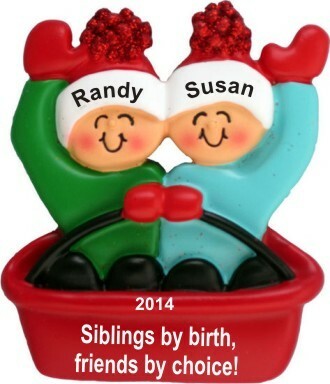 The adventures in sledding brother & sister personalized Christmas ornament will keep them smiling through the years as they remember these fun-filled years. It becomes a cherished memento with the addition of the details you provide. They'll be painted on by hand in a handsome font, and there's more room on the back for a longer message. Capture the joy of the thrills and spills with the siblings sledding personalized Christmas ornament in our plush velvet drawstring pouch.